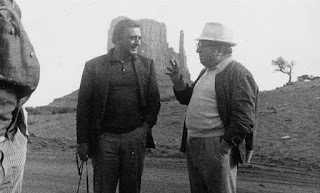 You may or may not be a fan of Sergio Leone’s spaghetti westerns, but there is no escaping the fact that they have an enduring influence; Quentin Tarantino, George Lucas and Martin Scorsese are self-confessed fans, and Clint Eastwood dedicated his Oscar for Unforgiven to Leone. 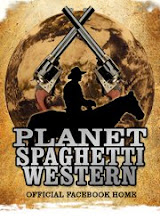 I grew up with spaghetti westerns — there was a time in the ’80s that they were a staple on Greek television, and not just Leone’s well-known ones, but also obscure ones by Sergio Corbucci, Enzo Barboni and others. 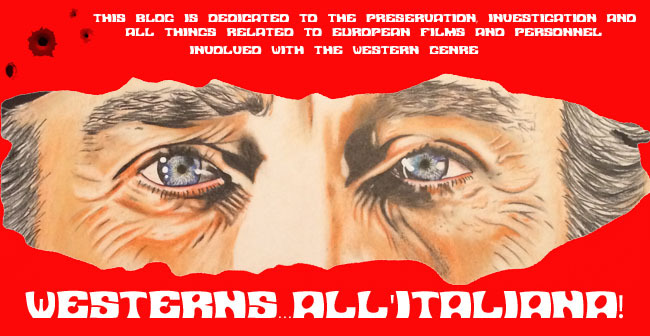 Some of these were real gems — I still think Corbucci’s The Great Silence is one of the best revisionist westerns to come from either side of the Atlantic. The main reason I liked spaghetti westerns was the iconography: the low-angle shots of larger-than-life characters, the stylized action and the comic-book sensibility that was so different from anything coming from the United States. They were also great fun to watch. Instrumental in the creation of that iconography was the work of production designer Carlo Simi, Leone’s collaborator and designer of films like For a Fistful of Dollars, Once Upon a Time in the West and The Good, the Bad and the Ugly. Looking at Leone’s films again, one can identify the visual devices and the carefully structured staging that Simi and Leone used to establish this highly stylized world. One of these visual devices was the way they used the architecture, the locations and the landscape to frame the action. A good example is the famous shootout in Sad Hill, the cemetery in The Good, the Bad, and the Ugly. 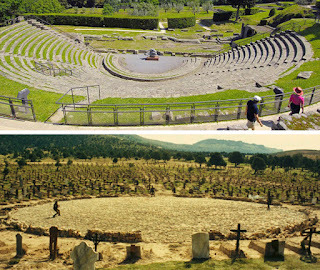 Setting this climactic scene within the big circular center of the cemetery elevates the characters from mere combatants to high-drama actors on stage in an ancient tragedy. This action framing is found everywhere in Simi’s work; every whitewash archway, every telegraph pole or wooden fence frames or complements a dramatic moment. 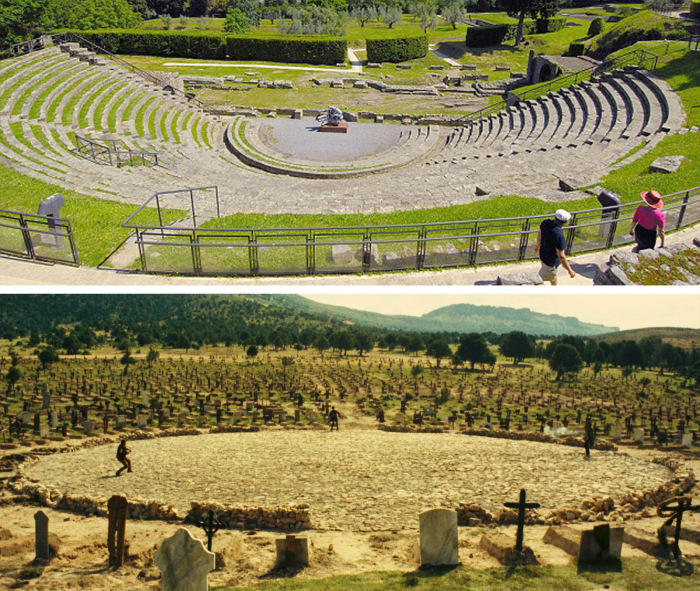 Above: Ancient Roman Amphitheatre in Fiesole, Italy. Below: Sad Hill cemetery. Highly stylised staging can be risky in cinema. In the hands of a less talented director, actors can become parodies of themselves, and in the hands of a less talented designer, stylised settings can lose their grounding in reality. Leone and Simi were clever enough to infuse their stylised settings with a great deal of historically accurate detail, thus making them believable. 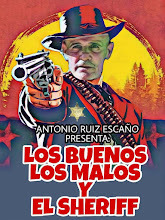 The Spanish location builds, like the famous town of ‘El Paso’ built in the desert of Tabernas in Almeria, look more real than the real thing. They easily compare with or surpass the detail in the best films of Ford or Peckinpah. But Simi did not just create the sets. He also designed the costumes, and is credited with the creation of the iconic poncho-caped look of Eastwood’s “man with no name” character. 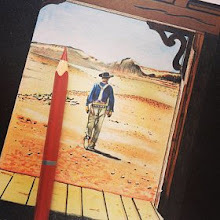 A testament to Simi’s influence is how much his costume and set designs have been imitated throughout the years, not just in westerns, but also in commercials, music videos and indeed in the work of postmodernist directors like Tarantino. Carlo Simi’s work in realising Sergio Leone’s vision of the Wild West illustrates perfectly how a production designer’s influence can occasionally define and characterise an entire genre, but also reach beyond that. For more information about Carlo Simi, check out a Facebook page dedicated to his life and work here.